This past weekend I had the fabulous idea to visit a local art centre with a friend of mine. We could browse the exhibits, discuss how this and that particular piece spoke to us and catch up on what’s been going on in each others life in their artsy café over lattes. Nope! It was almost a total wash, I say “almost” because other than an exhibit from an immigrant to Canada from the Netherlands during the war, the place left a lot to be desired. It was a trendy looking art centre downtown but it only had three exhibits which consisted of perhaps 20 pieces in total. So lets just say that didn’t take up very much time, 15 minutes tops. Now back in the car we thought what could we do? where could we go? 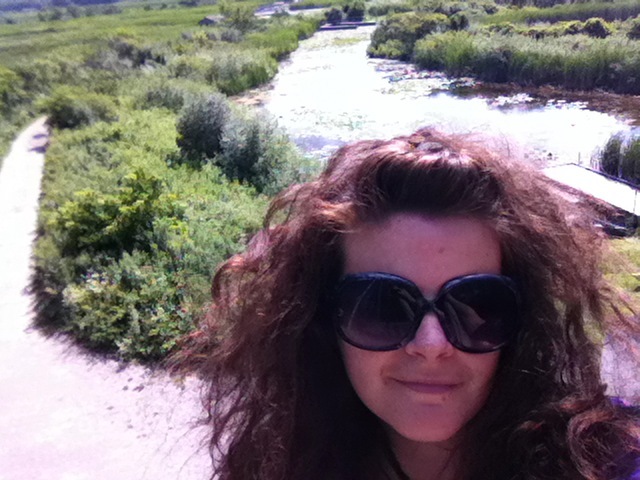 Instead of heading to the airport to catch a plane to an exotic locale, I offered up the idea of going up to the Wye Marsh, just an hour or so north of Barrie. “Great idea,” he said. And so we were off! The Wye Marsh Wildlife Centre was established in 1985 in Midland, Ontario (near Georgian Bay) and covers 3,000 acres of wetlands, fen and forest. At the Wye Marsh Wildlife Centre you’ll meet reptiles and amphibians, all native to the area, on display as well as birds of prey, can be seen on display or in one of the educational shows. 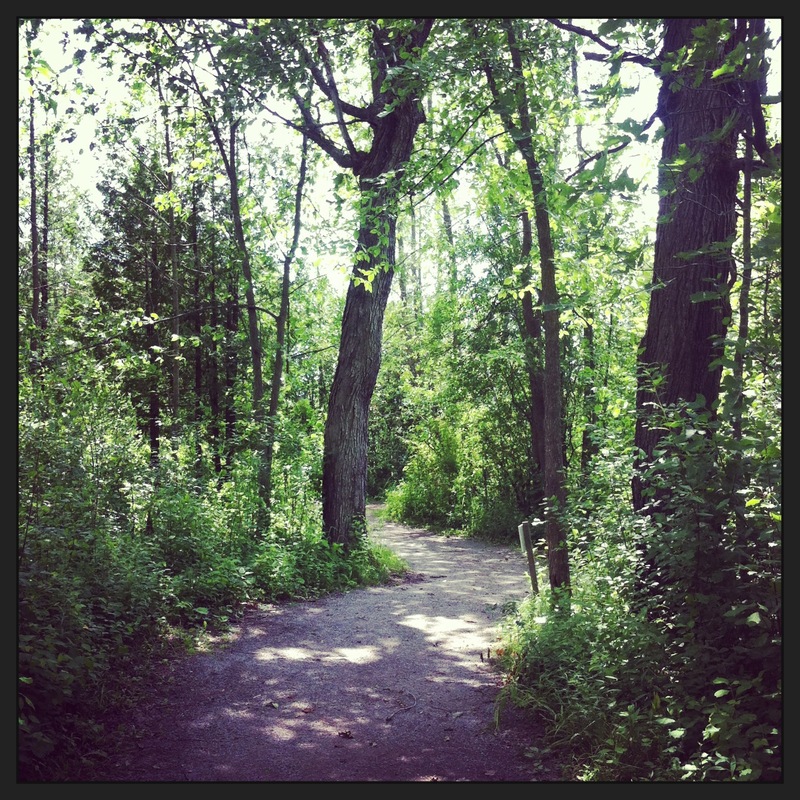 The Wye Marsh has over 25 km of trails and water routes and is open year round. The Centre offers a variety of activities from guided tours from on staff Naturalists to canoeing and kayaking along its waterways, as well as biking, hiking, snowshoeing and skiing trails. The Wye Marsh Wildlife Centre’s mission is “to spark a commitment to conserving wetlands, woodlands and wildlife by creating exciting learning opportunities in a natural setting.” Wetlands are one of the most diverse ecosystems in the world and have a huge impact on water quality, plant life and wildlife. 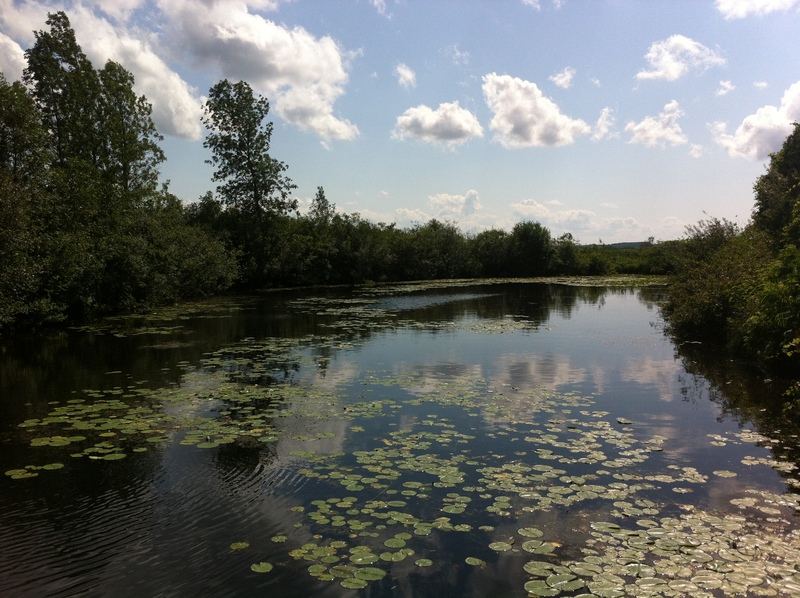 With over 70% of Canada’s wetlands having disappeared due to environmental stressors such as land development, invasive species and upstream runoff, the Wye Marsh is a vital and key habitat. I was thrilled when we walked in and ran into a friend from school who now worked there with the birds of prey. She offered to introduce us to a few of these great birds. 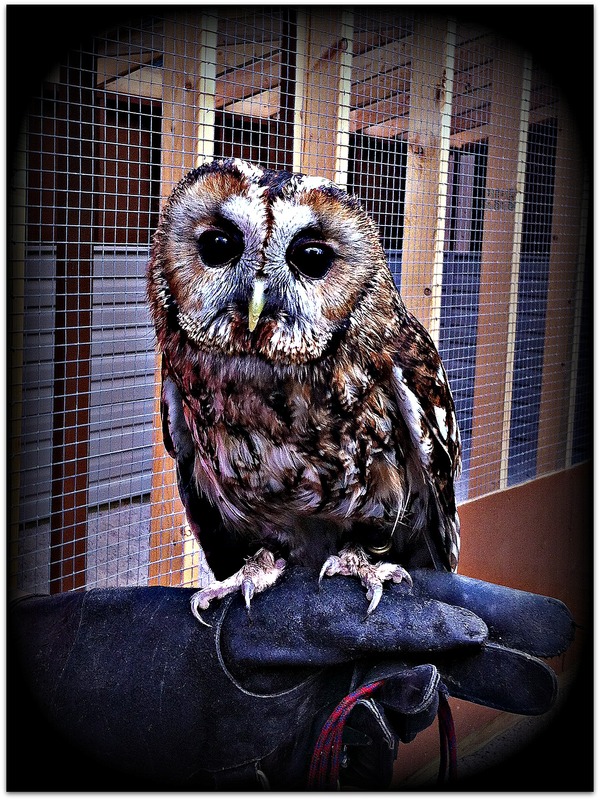 I was immediately drawn to the smallest of the bunch, a 4-year-old tawny owl named Alice. She was sweet and really had a personality that loved to be cuddled and being tickled around her neck that made her eyes flutter in enjoyment. I couldn’t help but look into her intriguing and darling eyes. 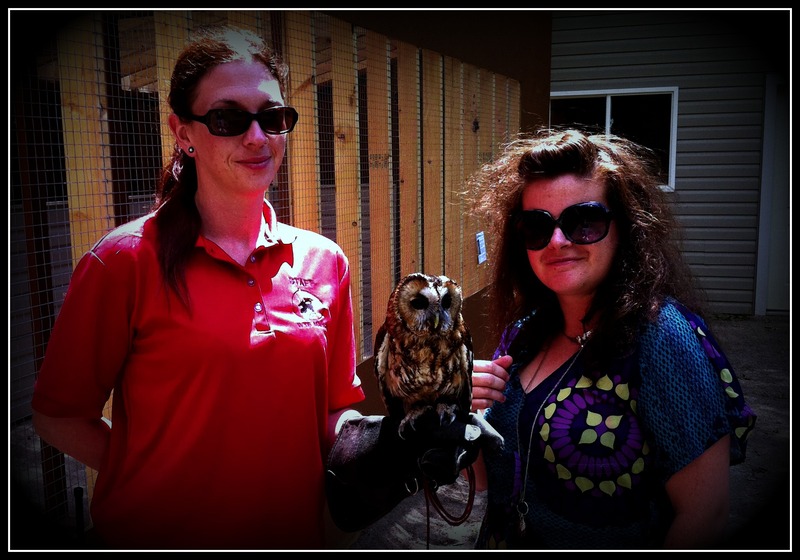 Next we met Axel, an Eurasian eagle owl, one of the largest owl species. He was only 3 but is full grown and though he weighs between 3 -4 pounds it’s clear he’s a strong bird who Shelly told me has quite the hearty appetite. I was so happy to see Shelly in her element, so at ease with yet aware of the birds she held, as well as friendly and confident when visitors came around to see the birds and ask questions. Truly a local Wildlife Ambassador at the Wye Marsh. After thanking Shelly we checked out the rest of the birds of prey like their mischievous looking snowy owl, the wide-eyed and comical looking spectacled owl and the Harris hawk who really pulled at my heart strings with his majestic beauty and every time I made a rolling purr sound at him he returned with one like it back. Strange to hear a bird make a cat’s purr sound! He seemed to want to come to me but was as close as he could get on a branch about a foot away. Too cute! We then headed for the boardwalk, of which there is 2 km of floating boardwalks. And boy what a beautiful day, the sun shinning, warm but without the oppressive humidity and a refreshing breeze. We strolled along the boardwalk, pausing to glimpse into the water for frogs, turtles, tadpoles as well as dragonflies and birds. Through the various trails like the Muskrat Loop, Hardwood Trail and Bee House Trail we encountered more birds like the cheery goldfinch and the proud robin as well as a few chipmunks, one of which chattered to us to either make sure we didn’t step on him or to tell us to get off his trail. I couldn’t believe how peaceful and relaxing it was wandering the trails, even for a couple of hours, but I kept thinking I have to come back soon and spend the whole day. There is so much to see and experience and a day spent in nature among wildlife is a day well spent. Our last stop was to the Observation tower. The view from the top gives a great view of the boardwalk and marshes for miles, it’s breathtaking! It was so serene to just stand there, looking out at the great scenery, bask in the warm sun and breathe it all in. Many of us remember the Wye Marsh from school trips out there to learn about nature and wildlife, with solid memories of feeding black-capped chickadees as they perched on my hand. Whether you’re solo looking for beautiful scenery, a couple looking for a picturesque place to canoe or a family looking to immerse their children in nature, the Wye Marsh Wildlife Centre is the place to visit.